﻿﻿﻿ The John Day Valley Chalet, as we like to call it, is located right above the town of John Day, Oregon and just below the local airport. It has a great view of the entire eastern valley and of Big Canyon Mountain to the south. It is a perfect vacation home for families or an ideal location as a corporate lodging facility for those coming for a few days on business in the valley. The Chalet is very private, sitting on 3 acres, out of sight of the few other homes in the area. It is completely furnished with a complete modern kitchen and all the amenities of a nice country retreat. It sleeps 6 in three spacious bedrooms with pillow top queen beds and a couple of single floor mattresses for the kids or extra vacationers. There are two full bathrooms, one with double sink and double shower and large walk-in closet. We provide Dish TV, a CD/VHS player with numerous videos, Wireless Internet and local/long distant telephone. There is a separate laundry room. Outside we have a 16 x 22 ft. deck with Patio set. Its steps go down to a large yard overlooking the valley complete with Gazebo, Fire pit, Horseshoe pit and outdoor lounging. The driveway is large enough for large RV's to turn around in or park next to the home itself. Like I said, the home is totally furnished and equipped. Just bring your suitcase and your groceries. It is beautiful, quiet and clean. Amenities: Fully furnished, Air Conditioned, 3 Bedrooms, 2 Bathrooms, 1 car garage, Large Deck with great view of the Valley, Linens Provided, Laundry Room with Washer/Dryer, Off Street Parking, Heating with Heat Pump, Private yard and outdoor seating, fire pit, and horseshoe pit, Downtown setting and close to parks, etc. 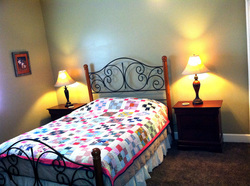 Beds: Three Queen Beds and two twin mattresses with frames available. 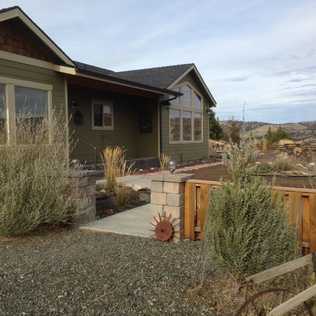 Outdoor Features: Covered 16 x 24 ft. Deck with table and chairs, fire pit, horseshoe pit and fabulous view of the John Day Valley looking east. For availability, check the calendar on the www.vrbo.com website under property 454253. The Base Rate is $165/night for up to 3 persons, with a two night minimum. Add $30 per night/per person for additional guests. There is a discount for stays over 5 days. We are also required to charge a 9% County and State room tax.